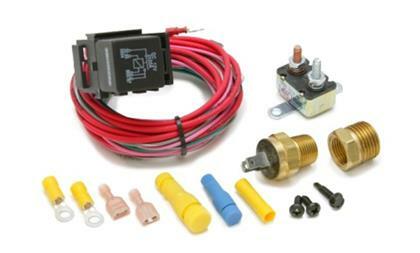 30114 - Painless Performance Electric Fan Control Kits - MiataRoadster - Stay tuned with MiataRoadster! Want your cooling fan to kick in automatically when your A/C comes on? This A/C Activated Cooling Fan Relay kit is what you need. Your cooling fan will activate when the engine reaches the preset temperature of the thermostatic switch or when the A/C is turned on. Only a few minutes for the installation and your cooling fan will come on when the engine reaches the preset temperature of the thermostatic switch mounted in the engine head or when the a/c is turned on. Kit includes: (3) 40 Amp relays with mounting bases, (1) fuse holder w/ 70 amp fuse, Pre-terminated and printed wire harness, Thermostatic switch 195°F on/185°F off (thread size: 3/8”-18NPT), 1/2”NPT to 3/8”NPT adapter, mounting hardware, insulated terminals, detailed instruction sheet. Designed as inexpensive protection for your electric fan. Provides constant voltage, protects from voltage and amperage spikes and keeps fan from feeding back through the system. An absolute necessity if adding an on/off switch to your electric fan circuit. Don’t want to probe your radiator? The Fan-Thom II comes with a threaded thermostat that screws into the engine block or manifold for a professional installation. Thermostat thread size: 3/8”-18 NPT fitting. Designed to allow a wide range of temperature adjustments for your electric fan.A bulb at the end of the capillary tube is inserted in the fins or attached to the top or hottest portion of the radiator. Use the adjustment knob to set a precise temperature desired for fan activation. The strong brushed stainless steel mounting bracket looks great. Complete kit includes thermostat, bracket, 30 amp relay, 30 amp circuit breaker for overall protection, wiring, terminals and hardware. Note: Temperature refers to the temp of the capillary tube, not the coolant temp. 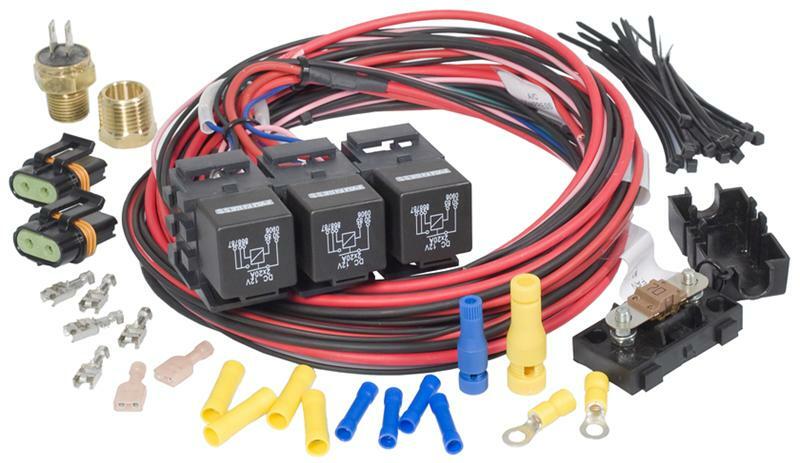 For the harsh conditions encountered off-road, these relay kits provide complete protection from the elements and ensure reliable and dependable performance. These kits utilize heavy duty waterproof relays, weatherproof circuit breaker covers and extreme condition weatherproof shrinkable crimp-on terminals. This relay kit is designed for running high amp dual fans or Monster fan set-ups.